Join us this Sunday at 11:00 for dynamic Christ centered worship borrowing from the beauty and depth of our traditions as well as the relational and engaging atmosphere of modern worship. The Confession of Faith is the statement of belief from The Evangelical United Brethren Church. Consisting of 16 articles, the current form of this statement of faith was presented and adopted by the 1962 General Conference. When The United Methodist Church was formed in 1968 from the union of several branches of the Methodist Church and the Evangelical United Brethren Church, both The Articles of Religion and the Confession of Faith were adopted as basic statements of the Christian faith. Click here to read more about the history of how this statement of faith came to be. 190 years ago a young Methodist preacher rode into an unruly town on the Mississippi River with a population of around 500 called Memphis TN. Reverend Thomas Davidson had a vision of starting a church from which other churches and even new denominations would grow. In February of 1826, Rev. 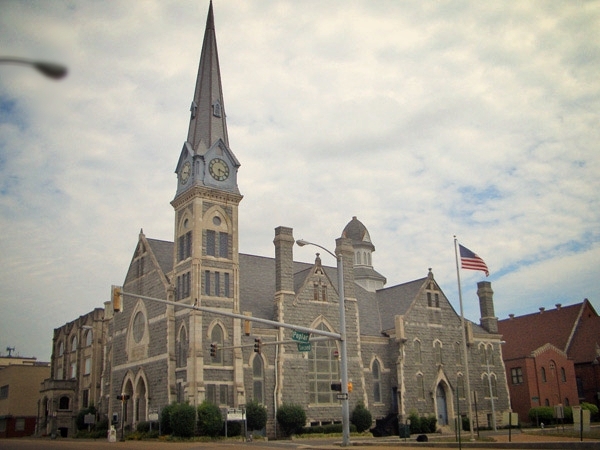 Thomas and three others held the first worship service of what would become the first church in Memphis and would later be called Memphis First United Methodist Church. In 1832, 11 faithful members sought to buy land and build a place of worship so they could increase their ability to reach out to the people of Memphis. Within a year, the church had been built upon the plot of land upon which First Church sits now and the membership had increased to 51 persons. 185 Years later, the people of First Church face a similar situation. In October of 2006, the historic sanctuary of Memphis First UMC caught fire and was totally destroyed. Along with the loss of the sanctuary, the adjacent offies and educational building known as the Pepper Building was also damaged to the point of needing to be completely rebuilt on the inside. After the tragic loss of our sanctuary, we have been worshiping in our education building for seven years. We strongly believe God is leading us to re-build the sanctuary so that we are better able to reach the people of Memphis and welcome them into a dynamic community of worship for many generations to come. With the gifts of the extraordinary generous people in the community as well as the proceeds from insurance, Memphis First was able to fully restore the Pepper Building as well as lay a foundation and erect the frame for the future sanctuary. Every space that has been purchased or re-built since the fire has been able to be used to further the mission and ministry of First Church. For the mission and ministry of First Church to continue to flourish and increase, it is essential we increase our worshiping community. We believe building a sanctuary will serve as a inviting and welcoming front door to the community of worship and provide an essential catalyst for reaching those who are not currently in worship on Sunday Mornings.